I was in the US for 3 weeks and came back Sat. on Delta with Maggie. I am a FF on DL mostly using it to get to FL or Bermuda. I find the airline perfectly ok except for trying to redeem miles. Anyhoo, when I bought my tickets I was concerned about the 45 min layover. Having had 2 parties lose their flights in the summer, I did not want to take chances. Mags and I had a 6:05 PM flight from Boston to ATL Friday. We arrived at 4:15 and were put on stand by for the 4:45 as our flight was delayed waiting for aircraft to come in from some snowy area. Now here is the tricky part. The computer read we were flying domestically as we had an overnight in ATL so wanted to charge us 15.00 per bag. The other snafu was we did NOT want to claim our luggage in ATL but have it sent thru. Because we had an amazing gate agent it all worked out. She worked it out that all 3 checked pieces went thru, yes 3! She also gave us receipts sending our luggage straight thru to Bonaire. We cleared the waitlist and boarded sitting in a two seater side in the bowels of the plane. We landed in ATL and walked for MILES to ground transport. We took a 11.50 US taxi to the Rennaisance (they have a free shuttle but I did not want to wait) and checked into a GORGEOUS room (84.00 AAA rate) with Aveda products, great bedding and windows that opened. We took showers and ordered pizza delivery from Best Pizza. A large cheese and fresh mushroom was 10.69 and arrived in 20 min.!! The crust was odd but the cheese and sauce great. Off to sleep…woke at 6, went to the business center and checked in online and printed boarding passes, took the 7:20 shuttle and chaos ensued upon arrival. ATL was chaos. I have not traveled peak time since 2002 so was in shock. The lines were massive…thankfully we walked right to security. There were ski lift lines moving very fast but long..took 30 min to clear security BUT it was efficient and I commend the staff. Then we took the train to Terminal E. I have a Business Platinum AX and so we went into the hugely crowded First Class lounge..noisey and busy. Went to the gate at 9 and boarded. We were in row 30 and had two aisles adjacent but the plane was not full so everyone moved around and Mags and I had her row with the middle open. We had to sit and wait 1 hour because luggage kept being loaded. The last minute another luggage cart came and lo and behold I saw our 3 pieces get loaded. Phew…it worked. We finally left 1 hour late. The flight was EXTREMELY bumpy and the family we called the Swine Flu family (in front of us) coughed for 4 hours. Dad not ONCE covered his mouth. Ugh…I slept most of the flight. We landed the same time as Arkefly. You can imagine our dismay knowing the lugggage situation. The immigration lines were massive and a few little ones needed their nappies changed DESPERATELY. When we got into the luggage area more chaos. Anyone who has flown in when two major carriers knows that the luggage on the conveyor needs to come off so other luggage can be loaded. Last Nov. I tried to round up a few men to help me and they looked at me like I was insane. This time I decided to let someone else brainstorm the problem. The same pieces went round and round..finally Julianna and another tiny girl from ground services started unloading..I joined in…then later a brawny guy took over…why don’t they have one person handling this all the time, I have no clue. It took us 1 hour to get our pieces. So, would I do DL again? NO WAY..too much stress…CO from Newark for me the best plan. In the winter if I need to travel will do AA to CUR and then DAE. 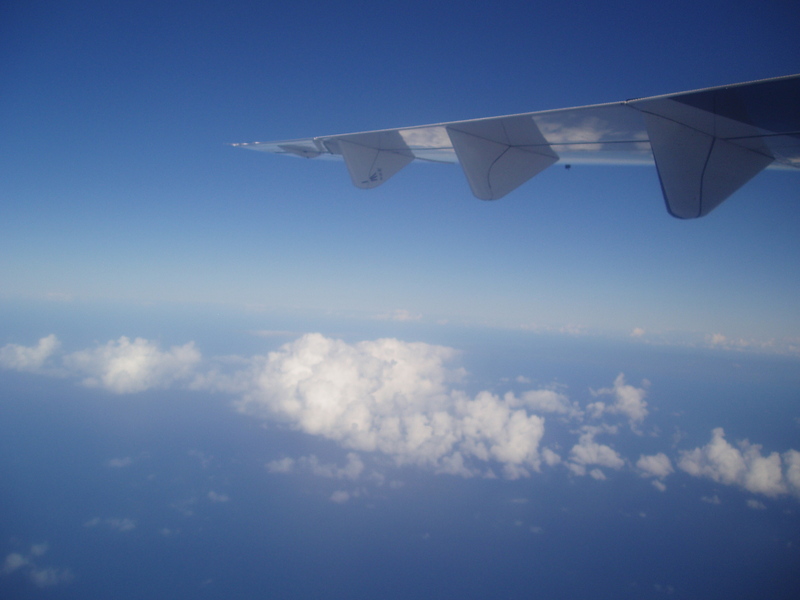 This entry was posted on December 22, 2009 at 1:08 pm and is filed under Getting to Bonaire. You can follow any responses to this entry through the RSS 2.0 feed. You can leave a response, or trackback from your own site.